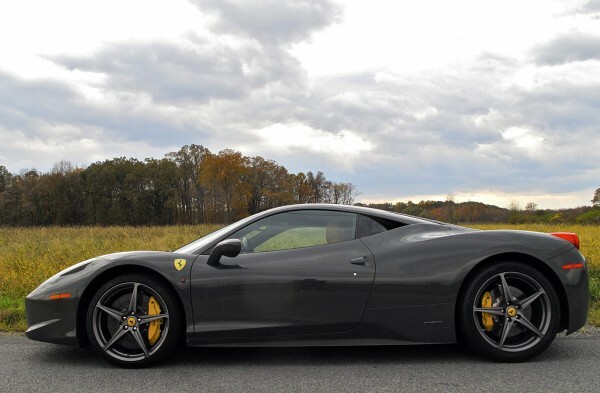 The Ferrari 458 Italia is the Italian automaker's latest mid-engine V-8 supercar; it's fast, fun and supremely nimble. Not to mention, expensive. NEW YORK — It’s 9:30 on Friday morning and the call comes: My Ferrari is outside. I bound downstairs to find a huge delivery truck outside my Manhattan apartment. Nestled inside is a new 458 Italia mid-engine coupe, in dark gray, with an interior of tan leather. The driver slowly backs it onto the street as a crowd gathers. Then it’s mine. Until Monday anyhow, when it must return to Ferrari’s northern New Jersey headquarters. If I’d actually bought this $225,325 car — not including the extra $57,000 in options and a serious markup at the dealership — and then waited for six months to a year, it would show up in my doorstep just like this. The 458 Italia is Ferrari’s latest mid-engine, V-8 supercar, the successor to the extremely successful F430. Of the current lineup, it’s the Ferrari I’d most want. I already know it’s fast, fun and supremely nimble, having tested it last spring around the company’s factory in Maranello, Italy. I’ve always wondered what it’d be like to own a Ferrari in New York City. Over four days and three nights, I’ll find out. I consider a road trip, then decide that would be selfish. I’ve promised numerous friends a Ferrari ride and it’s nearly impossible to lay hands on this rare beauty. My building’s super, Namko, was snapping cell-phone photographs as the car was delivered, so he gets the first shot. Petting the lovely tan leather seats, he says, “This is more comfortable than my bed.” Then I step on the gas and we shock forward. “My kids are not going to believe this,” he shouts. I remind him he’s now got phone photos. I head to midtown, where the car is hungrily eyed by a cluster of construction workers. I suddenly feel acute empathy for pretty women strolling down the streets in sundresses. “Two-fifty?” one hard-hat guy asks. He shrugs. “It still costs $250,000 either way.” Good point. Coasting into the circular courtyard of Bloomberg’s building between 58th and 59th streets, I pick up several of my editors (one at a time — this is strictly a two-seater). These are some of the folks who help craft my articles about the roaring engines on exotic cars, but rarely actually hear them. With the first crackle of the triple rear exhausts and ensuing supersonic propulsion, editorial reserves shatter. Each reaction is the same: giddy, slightly hysterical. This car makes you feel alive, partly because you can easily imagine dying inside it. Those stars in your eyes are actually oncoming stoplights. My last passenger of the day is an advertising executive whose clients have made for a miserable week. He’s never been in a Ferrari before. Soon his face is purple with adrenaline and he’s blowing air — but his worries are gone. I pull the 458 into my garage and he buys the first rounds of beers. I indicate my passenger, an attractive friend. “She’s only with me for my money.” She nods, playing along. “What’s wrong with that?” the guy asks. I dip into my bag of secret upstate roads, where the Ferrari can be a Ferrari. The 562-horsepower 4.5-liter V-8 is pliant in traffic, but is designed to wind up to 9,000 revolutions per minute on the way to 202 mph. The Ferrari’s sound is central to its character, as essential as smell is to a good Italian wine — maybe more so. The engine pops and burbles. At times it’s a swarm of angry wasps, other times a male lion crying out in a fitful dream. Often I put the seven-speed automated manual into an unnecessarily low gear, just to provoke an aural response. Sunday: On 34th street, a father points out the Ferrari to his young, blond-headed boy. The kid’s jaw drops. I goose the gas, causing him to jump up and down. His mom mouths a silent thank you. Downsides: The worry. Concerns that a warbling bicycle rider will knock off a mirror, that a swerving taxi driver will crease a fender, that a pothole will permanently swallow a very expensive tire. Perhaps the car is just too rare, expensive and fragile for these city streets. The fact that entire SUVs disappear into the considerable blind spot on the right side doesn’t help. Monday: Crushing reality. I have oral surgery scheduled, so there will be no early morning drive. The doctor slides a needle into my arm and reality blinks off. I later open my eyes and my first conscious thought: My Ferrari is gone.